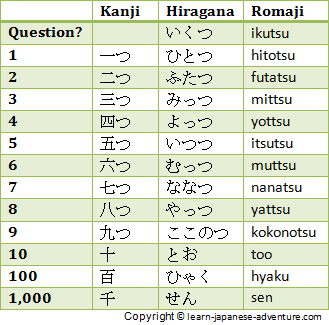 As mentioned before there are many Japanese counters used to count Japanese numbers for different objects. A counter acts as an indicator to show what kind of object you are counting. You can consider that counters are used to group similar objects. In English when you are counting object like shirt, you will say one shirt, two shirts, and so on. 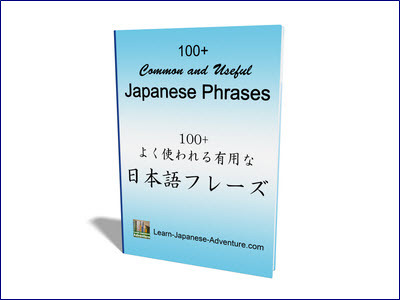 However in Japanese, the counter for flat and thin objects like shirt and paper is まい (mai). 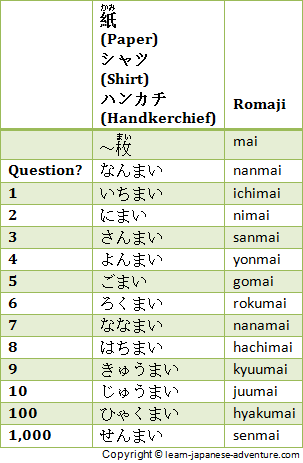 So you will say シャツにまい (sha tsu ni mai) for two shirts. 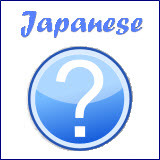 The counter for long and round objects is ほん (hon). 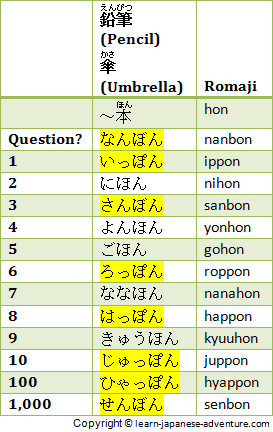 Therefore you will say かさよんほん (ka sa yon hon) for four umbrellas. But in English you always say four umbrellas. You might think that the Japanese counters are redundant. But let's think from a different perspective, you can possibly imagine what type of objects you will be counting by using counters. Let say someone told you he saw a rare animal in the zoo. Although he told you the name of the animal, you won't be able to know what it looks like because you have not seen that animal before. If he used the counter word 頭 (tou), you know that this is a big animal like horse or elephant. If he used the counter word 匹 (hiki), you know the animal is smaller in size, like a cat or dog. 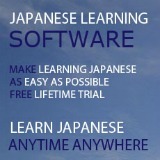 Therefore don't reject the idea of using counters in Japanese. You will see that they are quite useful when you study further. 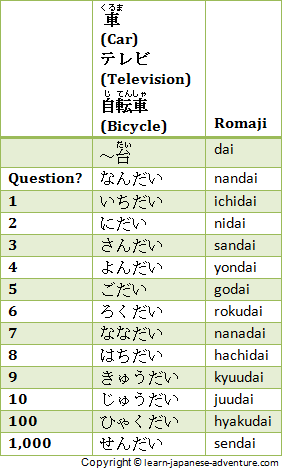 It is impossible to list all the counters here but I will show some common counters with pronunciations in romaji given. The table above shows the counter for money. 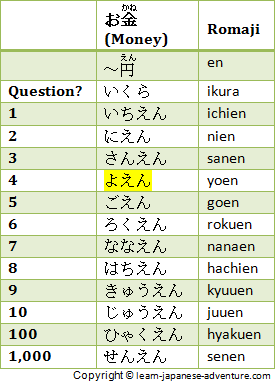 Take note that you should say よえん (yoen) for four yen, not よんえん (yonen). The table above shows the counter for kilometer and kilogram. 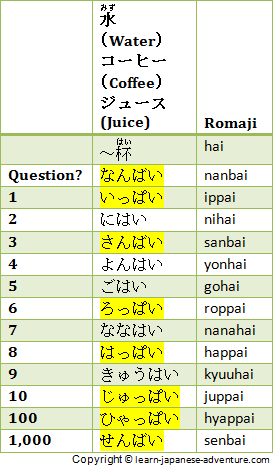 Take note of the different pronunciations required for the highlighted numbers. The table above shows the counter for books. 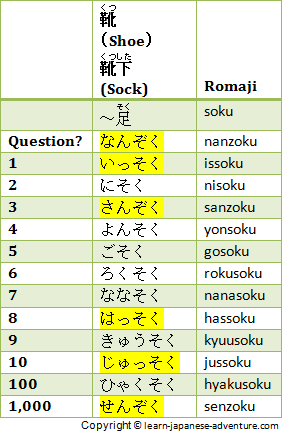 Take note of the different pronunciations required for the highlighted numbers. The table above shows the counter for shoes and socks. 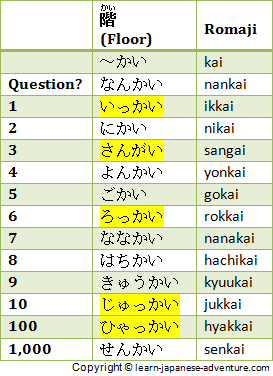 Take note of the different pronunciations required for the highlighted numbers. 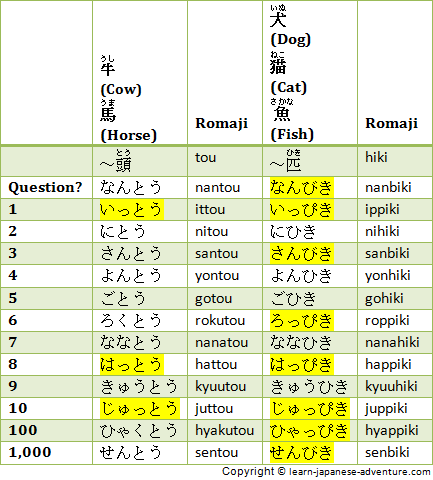 The table above shows the Japanese counters for animals. Different counter words are used for big and small animals. Take note of the different pronunciations required for the highlighted numbers. The table above shows the counter for long and round objects. Take note of the different pronunciations required for the highlighted numbers. The table above shows the counter for drinks. Take note of the different pronunciations required for the highlighted numbers. The table above shows the counter for floor. Take note of the different pronunciations required for the highlighted numbers. The table above shows the counter for people. Take note of the different pronunciations required for the highlighted numbers. The table above shows the Japanese counter for small objects. 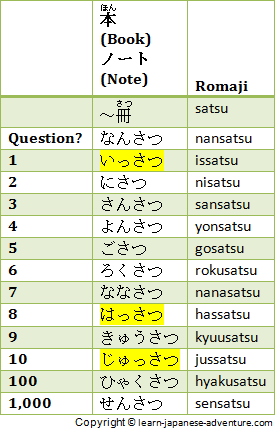 Take note of the different pronunciations required for the highlighted numbers. 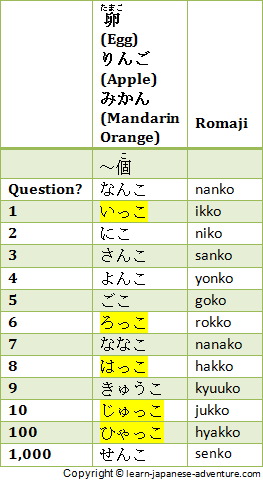 As you can see, in many cases you are required to pronounce differently for number 1, 3, 6, 8, 10 and 100, etc. 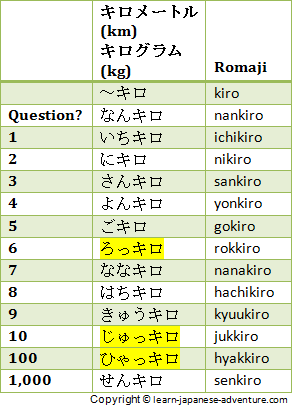 However the different pronunciations are not always fixed for these numbers. Therefore you will have to memorize them for different counters. After study them for some times, I am sure somehow you will know which number required different pronunciation for different counters. The table above shows another way of counting without using any counter which I mentioned earlier. However, you probably need to mention the counter somewhere in other sentences so that people know what you are referring to. 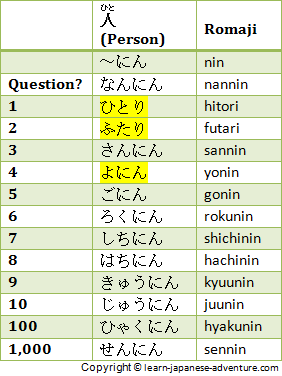 Take note of the different pronunciations for number one to ten.